Highly modified rivers are taking their toll on platypus. The platypus is a uniquely Australian species. Along with echidnas, platypus are part of an exceptional group of mammals which lay eggs, known as monotremes. Yet our 'duck-billed', egg-laying icon requires protection. It's classified as 'near threatened' in the 2012 Action Plan for Australian Mammals (CSIRO). It's also believed to be extinct in at least three Victorian waterways in the last few decades: Curdies River, the Avoca River and Bass River. In 2014–15, Victorian waterway managers used environmental water to support platypus, employing cutting-edge technology to monitor the outcomes of this watering. In autumn 2015, environmental water was released to support platypus in the Campaspe River, north-east Victoria. The same releases aimed to bolster platypus downstream in the Gunbower system (where there are probably fewer than 50 individuals), with the hope of re-establishing platypus elsewhere on the Victorian side of the Murray downstream of Echuca. Australian Platypus Conservancy biologist, Dr Melody Serena, says the lower Murray platypus population collapsed during the Millennium drought and that the autumn environmental water release provided deeper water to help protect dispersing juveniles from being killed by predators such as foxes. 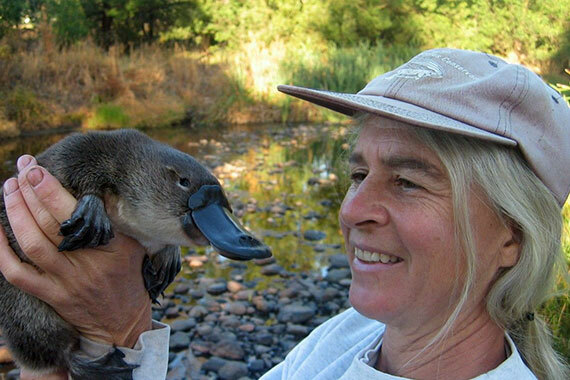 "The Campaspe is a really important source of juvenile platypus," she explains. "Platypus need to migrate to the Murray to recolonise and the only likely way that this will happen is to have conditions that support successful long-distance movements by small and inexperienced young animals." In the Wimmera system, platypus were once widespread but now the Mackenzie River supports the last known breeding population. In 2014–15, the Wimmera Catchment Management Authority (CMA) began using groundbreaking technology to improve platypus monitoring in its streams. The CMA is screening water samples for traces of platypus DNA using an innovative technique known as environmental DNA (eDNA). Wimmera CMA CEO, David Brennan, says the new technology will enable the CMA to detect platypus in a non-intrusive way. "With platypus, traditional trapping methods are labour intensive and understandably platypus are not that willing to wander into a net," he says. "This new technology means we can monitor more sections of river system where the community has reported seeing platypus and get a better idea of the extent of the species' current habitat." The great news is that, thanks to environmental watering, platypus are repopulating mid-sections of the Mackenzie River for the first time since the Millennium drought. "During the drought, the mid-section of the Mackenzie River dried completely and with it we lost platypus and their habitat," Wimmera CMA Environmental Water Manager Greg Fletcher says. "Now the annual summer and autumn environmental flows have made it possible for platypus to repopulate this section of the river." Meanwhile, in an Australian first, Melbourne Water acoustically tracked platypus during an environmental flow release to the Tarago River in autumn. Low water levels prior to the environmental flow had decreased platypus habitat and had put remaining platypus at risk of predators. Environmental Water Planner, Sarah Gaskill, says the monitoring showed that platypus movement increased through the flow period which is a positive sign. "During the environmental watering, platypus became more mobile, roving between receivers more frequently, and increasing the distances over which they foraged at night," she says. "We are using this information to improve our understanding of platypus' preferred flow conditions across our region. This is all very promising for establishing stronger platypus populations." Both the Wimmera and Tarago monitoring projects have been run in collaboration with Josh Griffiths from environmental research organisation cesar. Josh is a wildlife ecologist with extensive experience working with platypus in Victoria and Tasmania. "Platypus are very difficult animals to monitor effectively," he says. "We need to keep innovating and using new technology as it becomes available to understand the status of platypus populations and how human activities are impacting them. With this information, we can continue to modify and improve our management actions, including environmental water management, to protect platypus into the future." According to Australian Platypus Conservancy biologist, Dr Melody Serena, environmental water is critical for platypus to maintain and re-establish healthy populations. "Platypus are warm-blooded animals that need a lot of energy," she explains. "A female platypus towards the end of lactation will eat around 80 percent of her body weight in macro-invertebrates per day. Platypus like to eat aquatic insects, such as larval caddisflies and damselflies, as well as yabbies, worms and small freshwater mussels and shrimp. If a river is in drought or has very low flows, it won't attract enough insects and other food for platypus to breed and survive. "Flow is essential for breeding. During breeding season, the mother will lay one to three eggs in burrows in the stream bank. Once hatched, the young will stay in the burrow for about three months and during that period the mother needs to go back and forth regularly from the burrow to the water to find food. If the water level drops significantly below the burrow entrance, she will have to walk back and forth across land and so becomes an easy target for predators such as foxes. And of course, if she dies, so do her young. "The work being done by waterway managers is encouraging and the monitoring work is cutting edge," Dr Serena says. "Communities can also contribute to platypus conservation by getting into the habit of reporting their platypus sightings to their local waterway manager and, if they like, to the Australian Platypus Conservancy . "The more information we have about where these animals occur, the better we can target our support to ensure we have sustainable platypus populations." Find out how to report platypus to the Australian Platypus Conservancy. PlatypusSPOT collects the vast wealth of community information on platypus sightings and makes it public. It raises awareness about where platypuses are and their threats.